Please note that due to a fault on the line, our usual phone number is temporarily out of order. Please ring us on 01707 264037 instead. We are Osteopaths in Hatfield, Hertfordshire. 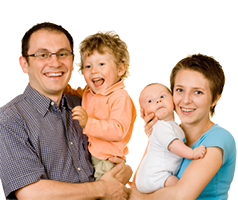 We provide Osteopathy for babies, children, adults and animals, including Cranial Osteopathy. Our Osteopathy service for people includes the diagnosis and treatment of common aches and pains, including back and neck pain. 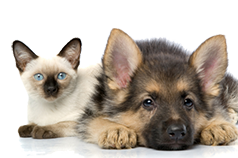 We also offer osteopathy and physiotherapy for dogs and cats with Sharon who holds a Post Graduate Certificate in Small Animal Rehabilitation Therapy. Osteopathy is a healthcare profession that utilises a patient focussed, physical approach to restoring, maintaining and promoting physical and psychological well being. Primarily, treatments take the form of a manual therapy. Sharon has been working as an Osteopath since 1999 and prior to this for ten years worked as a Remedial Massage Therapist. Sharon sees a broad spectrum of patients including animals and is now ably assisted in her people clinic by Associate Osteopath Rob Ballard. Osteopathic techniques influence joints, muscles, tendons, ligaments, fascia and nerves. Osteopathy helps relieve pain, making you feel better and helping you get back to your normal activities. In 1993 Osteopathy became the first major complementary health care profession to be accorded statutory recognition under the 1993 Osteopaths Act. The osteopathic profession is now regulated by the General Osteopathic Council who administer the statutory register of osteopaths. Only those practitioners who have demonstrated that they are safe and competent in the practice of Osteopathy and have been trained to the same rigorous high standards are eligible to the title.